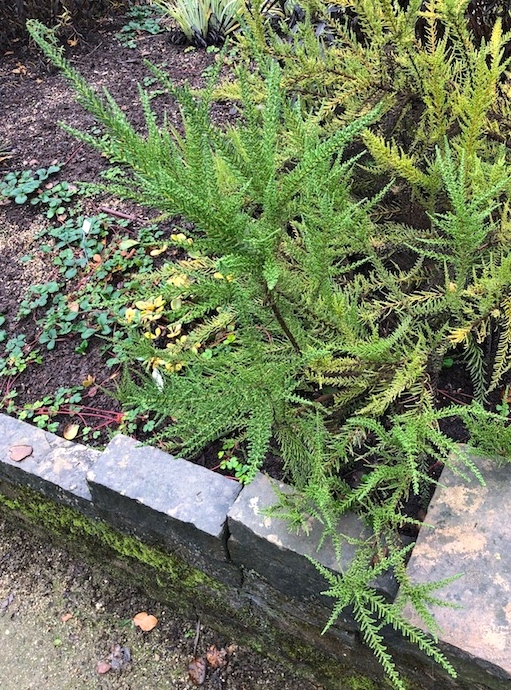 It began with a plant at the Gamble Garden in Palo Alto, a plant that reminded me of a cedar shrub, with scale-like leaves. This turned out to be Fabiana imbricata violacea (or Chilean heather — it was in the central Chile section of the garden, in fact), in the Solanaceae, the nightshade family (also including tomatos, potatoes, tobacco, petunias, and much more). Then in the South Africa section, a rather similar shrub, with scale-like leaves; this turned out to be a variety of Coleonema pulchellum (or confetti bush), in the Rutaceae, the rue or citrus family (which generally have broad leaves). The coleonema was growing together with some (broad-leaved) plants with interestingly contrasting foliage: some scented geraniums and some Martin’s spurges. Bringing in two more plant families — respectively, the Gerianaceae (or geranium family) and the Euphorbiaceae (or spurge family). All this led me to Calluna vulgaris, or heather (given that I already had “Chilean heather”), in still another plant family (the Ericaceae, the heath or heather family), with needle-like or scale-like leaves. And of course to cedars, with their scale-like leaves. Well, the cedars I first thought of were “Japanese cedars” — Cryptomeria japonica, in the Cupressaceae (or cypress family). But wait! The well-known cedar trees, the cedars of Lebanon, are Cedrus libani — with needle-like leaves, in the Pinaceae (or pine family). 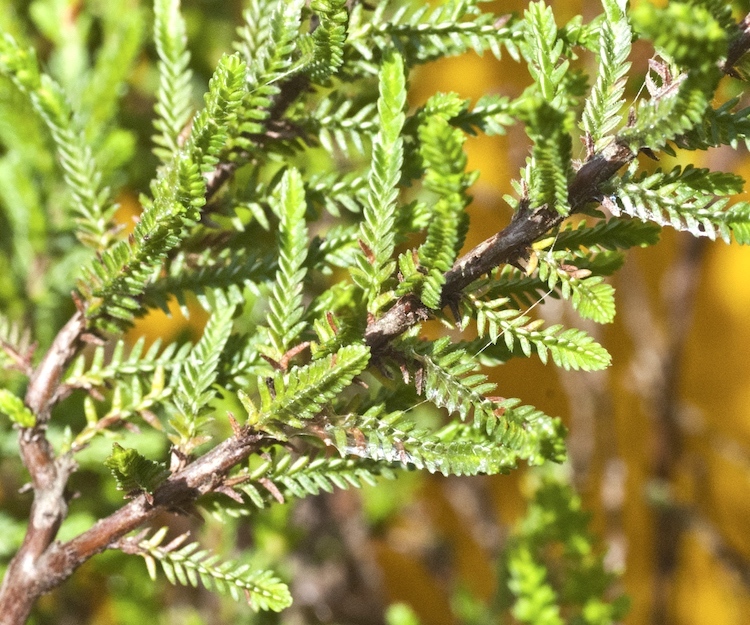 Ah, needle-like leaves — not just in (some) conifers, like the fir tree (in the Pinaceae), but also in other families: for example, in rosemary, in the Lamiaceae (the labiate or mint family, otherwise mostly broad-leaved). Two themes here: leaf types (broad, needle-like, scale-like) and plant families (including a number not already in my inventory, even though the plants in them are very familiar). 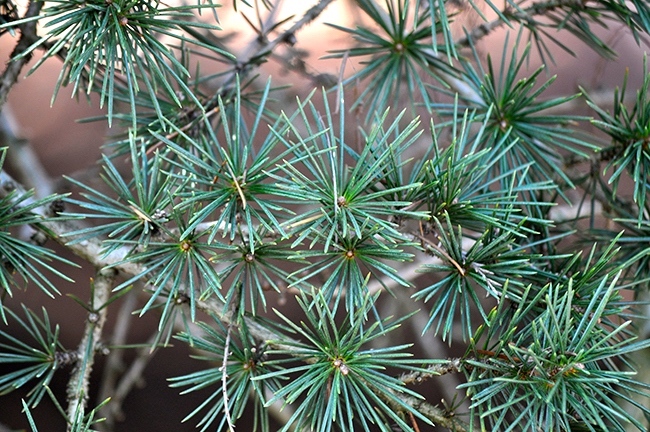 Plus, of course, the familiar agony about common names (think about those heathers, and those cedars). Details follow. Broad-Leaved plants are the most common plants in the Mid-Atlantic region. These are plants with wide leaf blades exposing a large surface area to the sun for photosynthesis and examples include the oaks, maples, and dogwoods. 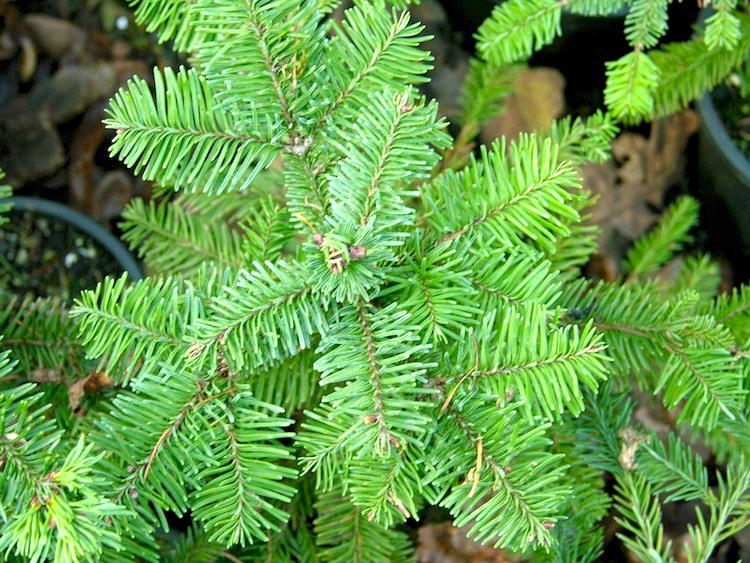 Alternatively, firs, pines and spruces, have needle-like photosynthetic organs. 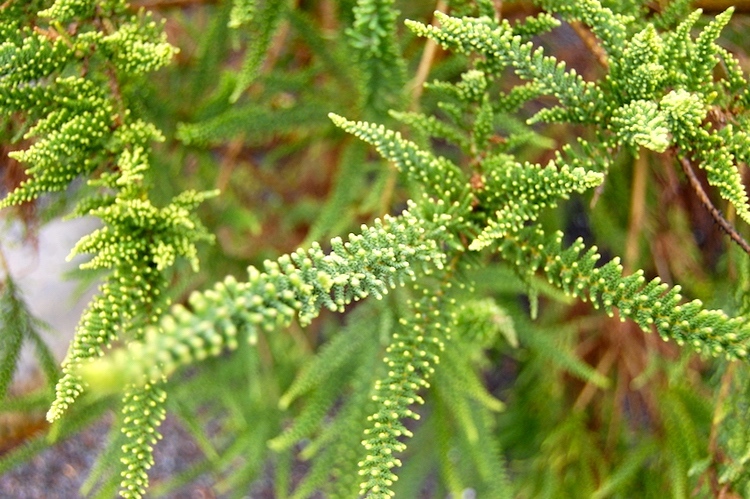 Scale-like leaves of junipers or cedars are comparatively short, overlapping, and resemble the scales of a fish. Fabiana imbricata (pichi [or Chilean heather, false heather]) is a species of flowering plant in the family Solanaceae, native to dry upland slopes in Chile and Argentina. 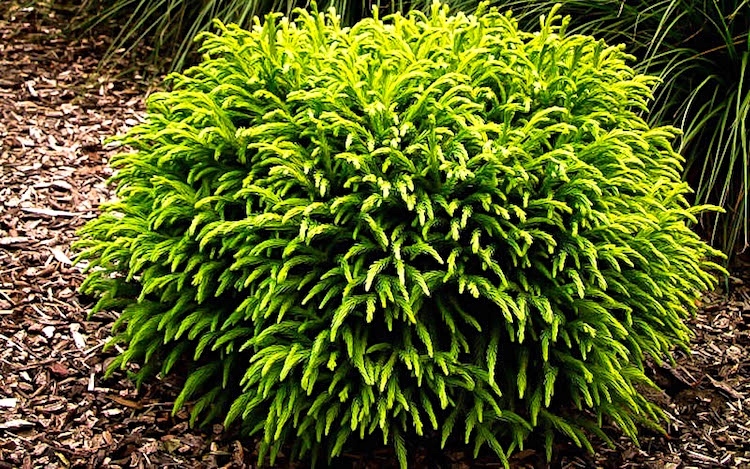 Growing to 2.5 m (8 ft 2 in) tall and wide, it is a frost-hardy, heath-like evergreen mound-forming shrub. It has [scale-like] leaves and small white, tubular flowers in early summer. 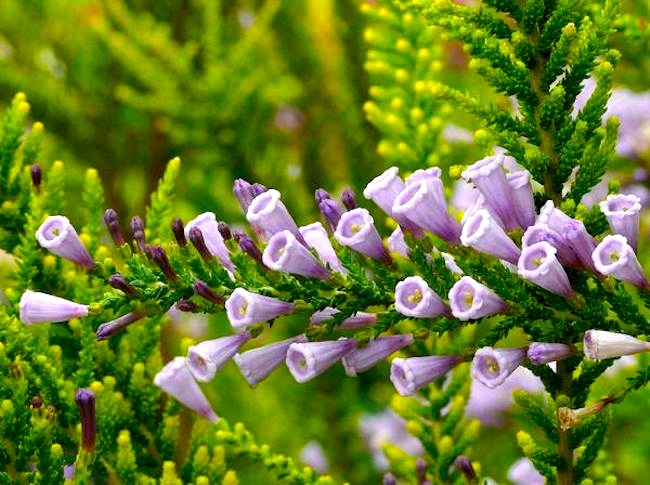 The upright form F. imbricata f. violacea, bearing masses of pale violet flowers, has gained the Royal Horticultural Society’s Award of Garden Merit. Coleonema pulchellum, commonly known as confetti bush, buchu, diosma or breath of heaven, is a shrub [in the Rutaceae, the rue or citrus family] which is endemic to South Africa. It grows to between 0.8 and 1 metre (2 ft 7 in and 3 ft 3 in) high. Single pink flowers to about 8 mm (0.31 in) in diameter appear between May and October in the species native range. … The species is naturalised in Victoria, Australia. The Rutaceae are a family (#84), commonly known as the rue or citrus family, of flowering plants, usually placed in the order Sapindales. Species of the family generally have flowers that divide into four or five parts, usually with strong scents. 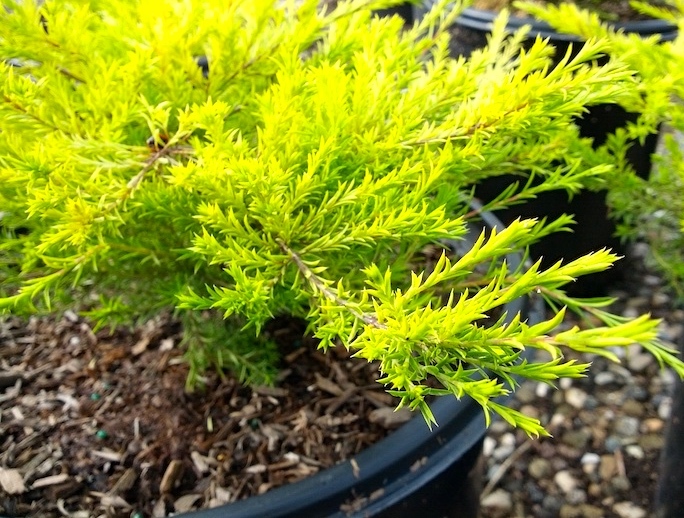 They range in form and size from herbs to shrubs and large trees. Ruta (commonly known as rue) is a genus of strongly scented evergreen subshrubs, 20–60 cm tall, in the family Rutaceae, native to the Mediterranean region, Macaronesia and southwest Asia. There are perhaps 8 to 40 species in the genus. 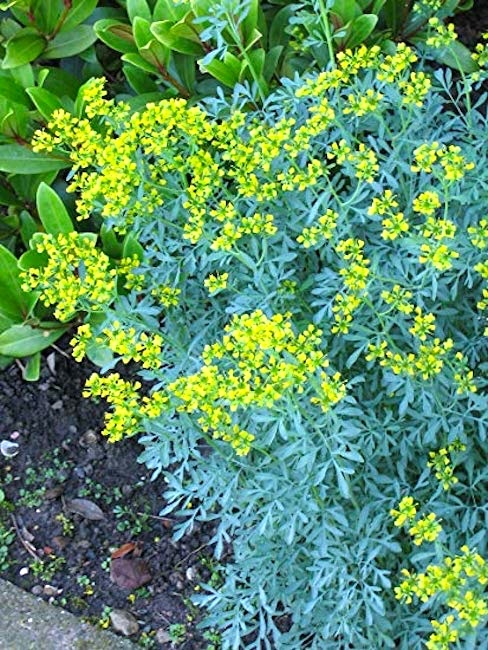 The most well-known species is Ruta graveolens (rue or common rue [or herb-of-grace]). The leaves are bipinnate or tripinnate, with a feathery appearance, and green to strongly glaucous blue-green in colour. The flowers are yellow, with 4–5 petals, about 1 cm diameter, and borne in cymes. Geraniaceae is a family of flowering plants placed in the order Geraniales. The family name is derived from the genus Geranium. The family includes both the genus Geranium (the cranesbills, or true geraniums) and the garden plants called geraniums, which modern botany classifies as genus Pelargonium, along with other related genera. Euphorbia × martini [also identified as martinii], Martin’s spurge, is a hybrid between two species of flowering plant, E. amygdaloides × E. characias subsp. characias in the spurge family Euphorbiaceae. It was found growing wild in southern France. 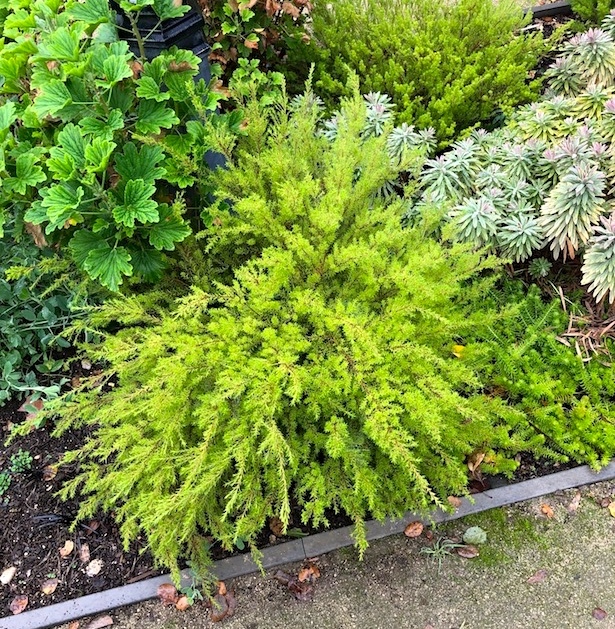 Growing to 60 cm (24 in) tall and broad, it is a dwarf evergreen subshrub with narrow grey-green leaves and in late spring and early summer, sprays of lime green flowers, often with a red or maroon eye. It is useful as a spreading, weed-smothering groundcover. Though hardy down to −15 °C (5 °F), it is a Mediterranean plant best grown in a sheltered spot in well-drained soil in full sun. All parts of the plant are toxic if eaten, moreover euphorbias produce an irritant milky sap when cut or broken. Numerous cultivars have been developed for garden use, of which the following have gained the Royal Horticultural Society’s Award of Garden Merit: ‘Ascot Rainbow’, ‘Helen Robinson’. Euphorbia is a very large and diverse genus of flowering plants, commonly called spurge, in the spurge family (Euphorbiaceae). “Euphorbia” is sometimes used in ordinary English to collectively refer to all members of Euphorbiaceae (in deference to the type genus), not just to members of the genus. Some euphorbias are commercially widely available, such as poinsettias at Christmas. Some are commonly cultivated as ornamentals, or collected and highly valued for the aesthetic appearance of their unique floral structures, such as the crown of thorns plant (Euphorbia milii). Euphorbias from the deserts of Southern Africa and Madagascar have evolved physical characteristics and forms similar to cacti of North and South America, so they (along with various other kinds of plants) are often incorrectly referred to as cacti. Some are used as ornamentals in landscaping, because of beautiful or striking overall forms, and drought and heat tolerance. … The plants share the feature of having a poisonous, milky, white, latex-like sap, and unusual and unique floral structures. The Euphorbiaceae, the spurge family, is a large family of flowering plants. 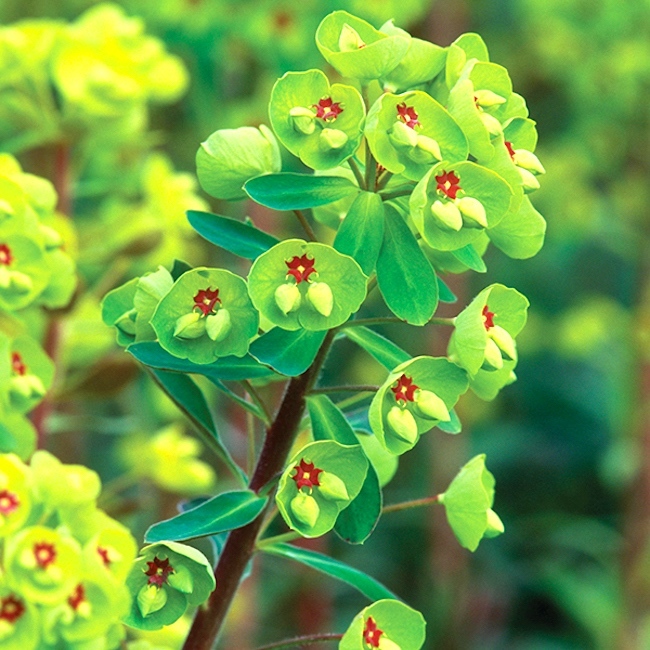 In common English, they are sometimes called euphorbias, which is also the name of a genus in the family. Most spurges such as Euphorbia paralias are herbs, but some, especially in the tropics, are shrubs or trees, such as Hevea brasiliensis [the rubber tree]. 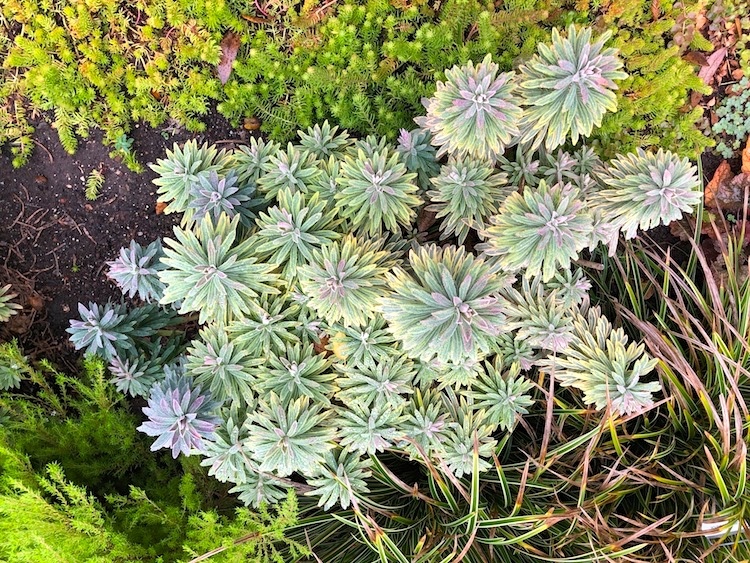 Some, such as Euphorbia canariensis, are succulent and resemble cacti because of convergent evolution. This family occurs mainly in the tropics, with the majority of the species in the Indo-Malayan region and tropical America a strong second. A large variety occurs in tropical Africa, but they are not as abundant or varied as in the two other tropical regions. However, Euphorbiaceae also has many species in nontropical areas such as the Mediterranean Basin, the Middle East, South Africa, and the southern United States. 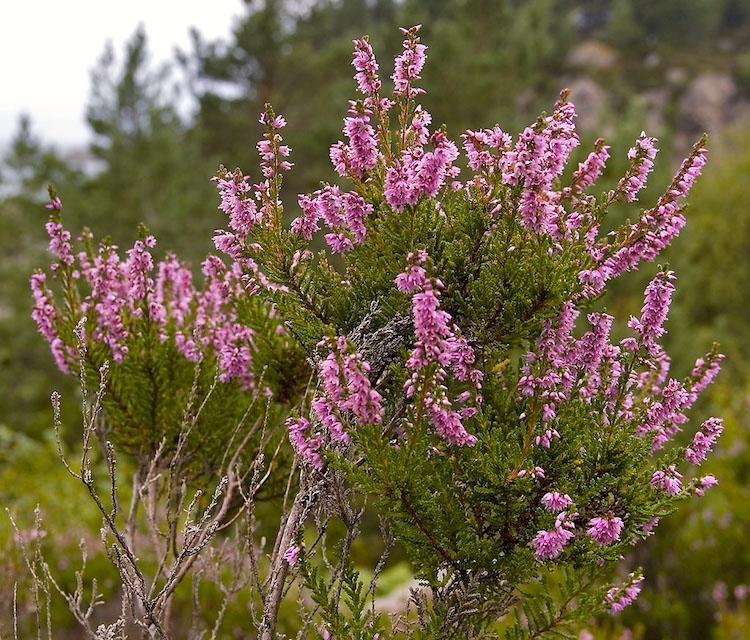 Calluna vulgaris (known as common heather, ling, or simply heather) is the sole species in the genus Calluna in the flowering plant family Ericaceae. It is a low-growing perennial shrub growing to 20 to 50 centimetres (7.9 to 19.7 in) tall, or rarely to 1 metre (39 in) and taller, and is found widely in Europe and Asia Minor on acidic soils in open sunny situations and in moderate shade. It is the dominant plant in most heathland and moorland in Europe, and in some bog vegetation and acidic pine and oak woodland. It is tolerant of grazing and regenerates following occasional burning, and is often managed in nature reserves and grouse moors by sheep or cattle grazing, and also by light burning. The Ericaceae are a family of flowering plants, commonly known as the heath or heather family, found most commonly in acid and infertile growing conditions. The family is large, with c. 4250 known species spread across 124 genera, making it the 14th most species-rich family of flowering plants. The many well-known and economically important members of the Ericaceae include the cranberry, blueberry, huckleberry, rhododendron (including azaleas), and various common heaths and heathers (Erica, Cassiope, Daboecia, and Calluna for example). The Ericaceae contain a morphologically diverse range of taxa, including herbs, dwarf shrubs, shrubs, and trees. The cedar world. Cedar is a name given to various woods, mostly scented, and then to the trees the wood comes from — mostly, though not entirely, in two plant families, Cupressaceae (#88) and Pinaceae (#87). Cupressaceae is a conifer family, the cypress family, with worldwide distribution. The family includes 27–30 genera (17 monotypic), which include the junipers and redwoods, with about 130–140 species in total. … The bark of mature trees is commonly orange- to red- brown and of stringy texture, often flaking or peeling in vertical strips, but smooth, scaly or hard and square-cracked in some species. … On young plants, the leaves are needle-like, becoming small and scale-like on mature plants of many genera; some genera and species retain needle-like leaves throughout their lives. Cedrus (common English name cedar) is a genus of coniferous trees in the plant family Pinaceae (subfamily Abietoideae). They are native to the mountains of the western Himalayas and the Mediterranean region, occurring at altitudes of 1,500–3,200 m in the Himalayas and 1,000–2,200 m in the Mediterranean. Now, into Christmas weekend with a fir tree. This entry was posted on December 20, 2018 at 11:41 pm and is filed under Language and plants, Names, Taxonomic vs. common. You can follow any responses to this entry through the RSS 2.0 feed. You can leave a response, or trackback from your own site. There’s also a tree, variously called Northern (or Eastern) Red Cedar among other names, which is taxonomically a juniper, Juniperus virginiana. We have large numbers of them on our Gloucester property.